Join the discussion on our forums! 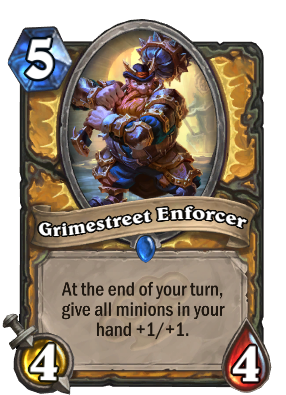 Come discuss Grimestreet Enforcer over in our dedicated Grimestreet Enforcer discussion topic. At the end of your turn, give all minions in your hand +1/+1. "Sir, you don't have a permit to park your mount here." 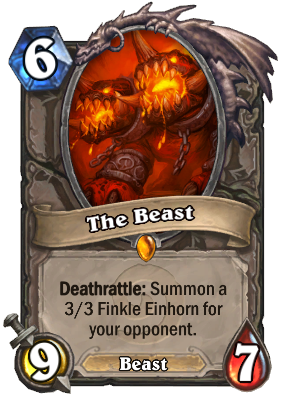 This card is insanely strong, and really needs either a stat nerf so it's easier to remove or a cost increase. With it's current stats and cost, it'd be decent if it only had Grimestreet Outfitter's ability. It's great value even if it is removed immediately, and it can easily win the game for you if your opponent can't remove it the turn you drop it. Turns out this card is preeeeeeetty good </kripperino> in a midrange pally deck. Way too slow for aggro, but once you couple this with a big hand (which is easy to build up thanks to stuff like Meanstreet Marshal and Small-Time Recruits) the card gets huge value on the turn it's played. Similar to Murloc Knight or Emperor Thaurissan, it's also a big threat that must be removed asap by your opponent or they risk dire consequences...ever played 3x 6/6 minions for 5 mana thanks to a beefed up Doppelgangster? Let me tell you firsthand that it's hilarious. 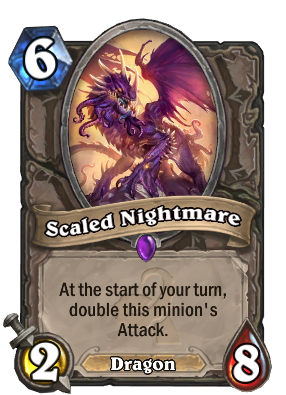 Solid card overall that fills the awkward gap in the 5-mana slot left by stuff like Loatheb and Sludge Belcher rotating out. I think they went overkill with this effect. 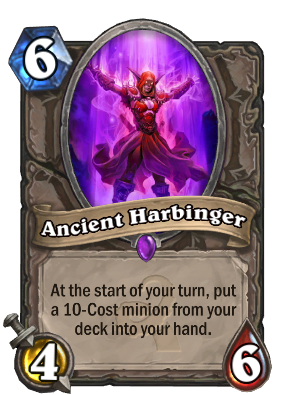 This one seems the least useful, by turn 5 most of your hand would be empty if you're playing an aggressive deck. Well then maybe it isn't for an aggro deck lol ? Yea, even given the new effect, too bad they couldn't come up with more interesting ways to use it. Give spell damage or taunt (+can't be targeted by spells). Reduce cost of a random spell by 1. Give a random beast charge. Make a random non-pirate minion talk like a pirate, etc. 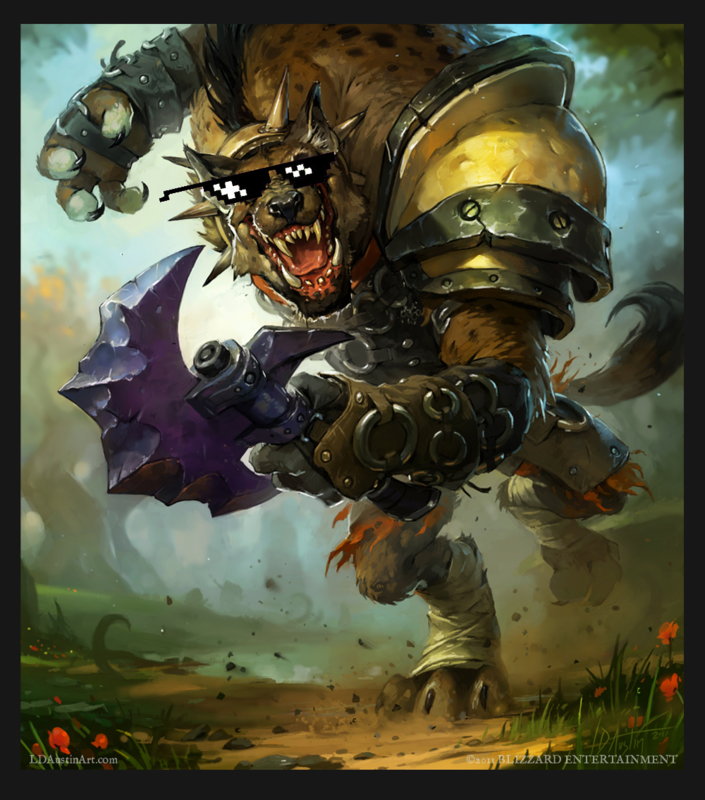 By the power of Gadgetzan! I have the POWER! 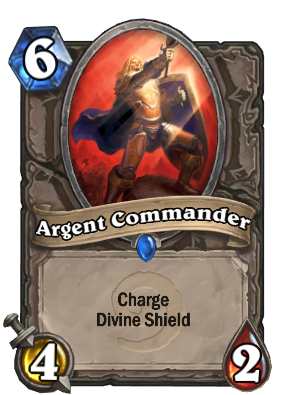 This Aggro Paladin deck is looking promising, although priest is gonna kill all the aggro decks. 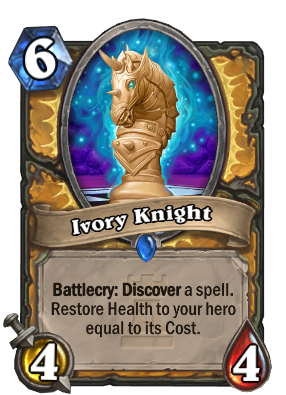 This is trash, anyone who thinks otherwise doesn't play Paladin enough. I guess it will see some good pick rate in the arena games. A bigger, later-game version of Grimestreet Outfitter, I like it.